Kit on the right, three Super Gobblers! I took a buddy of mine from Louisiana out Turkey hunting. He had never shot a turkey in (location not disclosed). The first day started good when we called in 5 Jakes that were so close we could have touched them with our barrels. The rest of the day we hunted hard and only had two birds gobble briefly. We went home extremely tired and empty handed the first day. The second day was a whole different story!!! We got to the farm well before sunrise, and the second that we shut the doors to my truck the woods seemed to be alive with gobbles coming from every direction. It was a complete 180 from yesterday. We had a huge storm in the area on Thursday night. Friday and Saturday were cold and windy. But today was nice and calm, so the birds were ready to get their ladies back. We must have heard 20 different gobblers all around us. We waited on a hillside until all of the birds pitched down for the morning. None of the birds were coming to our calls so we decided to hike to the top of the hill on the farm. From there we spotted a group of four gobblers. We belly crawled completely exposed through pasture that was only 8" tall grass. All the while, keeping the one tree on the hill, between us and the Toms. Once we got within 120 yards of the birds, one of the Toms had spotted us and believe it or not, was coming to us. I had a greenish brown backpack on that I think may have resembled a turkey walking thought the grass as we were crawling. The bird took about 10 minutes to walk that distance, stopping and strutting every 20 yards or so. It finally got within shooting range and George let him have it, BOOM! The Gobbler dropped. Right after the gun shot one of the other birds gobbled... That meant my turn!!! I went after this bird on my own, leaving George on the hillside to give me direction to the still gobbling birds whereabouts. I had to go down a gully and back up to reach the bird that was on the hill top 100 yards away. When I crested the hill top at first I saw nothing and assumed that the bird had left. I crawled a little farther and sat up Indian style and the bird's head popped up. When bird looked up I could see the beard and red on the head and I let him have it. WHAM, another 50 yard shot and the bird dropped. George and I meet up and we laughed and rejoiced about our great success, we packed our birds in our backpacks, and headed down the hill back to the truck. On our descent back to the truck we spotted another group of turkeys, and since George had one more tag to fill we decided to go after them. We hiked down into the valley and back up the side of the hill that the group of turkeys were headed. We sat down in a location that we thought the birds might be in and we made a few calls. Instantly we heard a gobble just above us on the hillside about 70 yards away. We snuck up the side of the hill and sure enough we had put ourselves within shooting range of another group of mature gobblers. 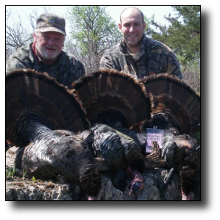 George picked out the bird on the right and WHAM, down dropped our third longbeard of the day. It was an absolute amazing day of turkey hunting, the farm was about 200 acres and we successfully spotted and stalked 3 separate gobblers in a little over an hour. Wow!!! 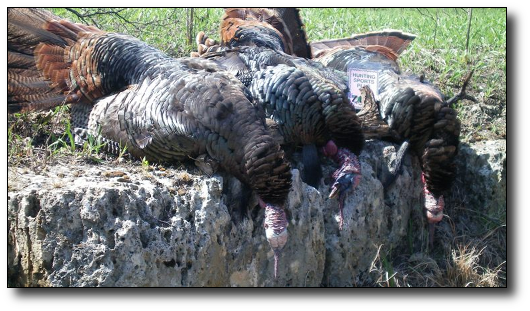 The gobbler that I shot weighed 19lbs, had a 10" beard, and 3/4" spurs. The first bird that George shot weighed a massive 27 1/2lbs, had a 10" beard, and 1 1/4" spurs. The second turkey that George shot was 21 lbs, had a 10" and 4" beard, and 1 1/4" spurs. What an amazing trip. Needless to say it made the 12 hour drive from Louisiana worth it for George.